Series 5 display box contains 18 randomly selected 2-inch tall mini-figures. 14 points of articulation, interchangeable parts and accessories. The Teenage Mutant Ninja Turtle Minimates Series 5 Display Box contains 18 randomly selected, individually blind-packaged, 2-inch tall mini-figures with 14 points of articulation and interchangeable parts and accessories. Teenage Mutant Ninja Turtles fans simply can't get enough of these Minimates, and Series 5 is totally radical! This Teenage Mutant Ninja Turtle Minimates Series 5 Display Box contains 18 individually blind-packaged mini-figures. 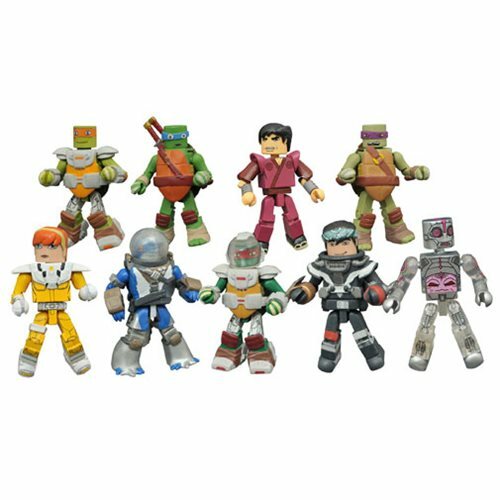 Series 5 features Space Raphael, Space Michelangelo, Leonardo, Donatello, Space Casey Jones, a Kraang, a Salamandrian, and rare figures of Hamoto Yoshi and Space April O'Neil! Each 2-inch mini-figure has up to 14 points of articulation and features fully interchangeable parts and accessories. The full-color counter display contains 18 foil-bagged Minimates. Ages 8 and up.